L’Occitane, a make-up brand from Province in France, has a cafe which is facing Shibuya’s Scramble Crossing.Last time I entered this cafe, I saw many international tourists with Tokyo guidebooks in the hand, who were perplexed in the cafe and left at last, although it is a great cafe. In this post, I’d like to explain what is happening there and how to deal with it. I’m happy if you see why it was and make your trip to Shibuya more exciting than ever. L’Occitane Cafe in the main street of Shibuya! Undoubtedly, L’Occitane Cafe is FASCINATING. This is Acai Bowl I ordered (1130 yen.) 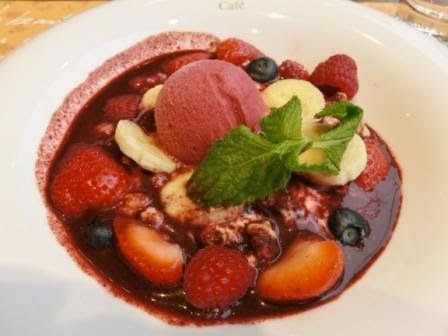 (Acai is from deep in Brazil and getting popular and popular in Japan now. Served with fruits, granola, yoghurt and sometimes sorbet.) Its tastes were so delicate and I liked it so much. Not seasonal menu like this, Quiche Plates are very popular. All the dishes are around 1,000 yen. Talking about drinks, their series of herbal tea are Excellent. And a big feature of the cafe is its location. 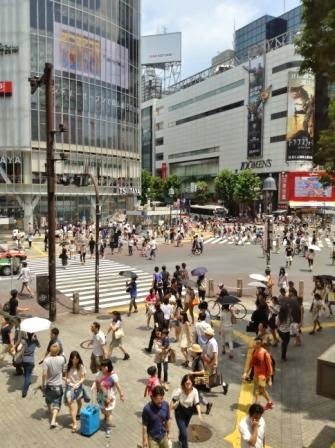 If you fortunately get a table near the large windows, you can see the Scramble Crossing, one of Shibuya’s symbols. Here is one of my photos from there. After all its features, there are always international travelers and Japanese first-time visitors leaving there before they enter. To start with the conclusion, this cafe has a staffing problem; They are always short of waiters, waitresses and cooks. I arrived at the cafe as the first photo of this post. It was some minutes past 11 a.m. I saw some empty tables along the windows from the outside. They have two floors for the cafe, so it is natural to expect I can enter soon. When I went up the stairs to the 2nd floor, however, there was a line at the entrance. 6 to 7 people were there, I think. No waitress was dealing with the line, and it seemed that the people were waiting for a while. I waited because I knew the truth, but I saw 4 international families and several travelers giving it up with one single glance at the line; They thought it’d take long just to enter. But some empty tables are seen from the line! STRANGE. In 5 minutes, I got my table. When a waitress is free, she welcomes several groups at one stroke, so the line disappeared…. for a while. Have a table inside the cafe. The cafe is colored bright orange. And furniture is wooden, some plant pots are along the windows and walls are decorated with cool photos. They make me so fine. 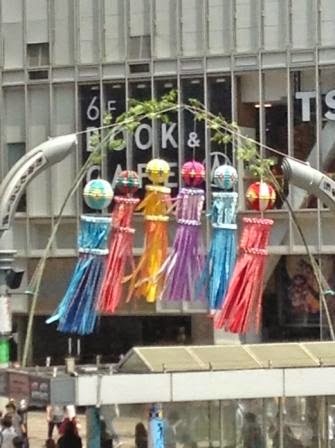 Talking of the view again, I saw Tanabata (in Lunar calendar. early August in Solar calendar) decorations over there…. While I was waiting for my dish, I saw an international visitor. In total 25 minutes, I got that Acai Bowl. It was so delicious. I enjoyed foods and views, got a shampoo sample and left there to my next destination. When talking a bit serious, similar situations are seen in Japan these days and it’s a problem. I don’t think I should be more serious to discuss it in this travel blog, but in short, too many Japanese recruiters, shop managers and executive workers are not skilled enough to run a cafe, restaurant, shop or company. What a loss! Don’t you think so? 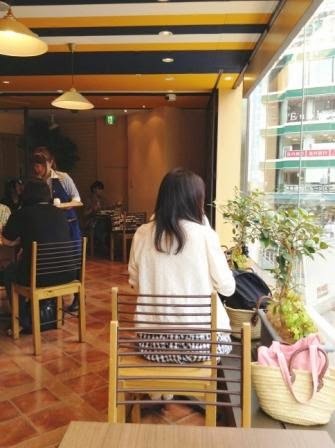 I strongly wish L’OCCITANE Cafe Shibuya employs more staff members soon. At the end of this post, here are the solutions for you and me. So, if you don’t mind just 5 or 10 minutes, let’s wait. I do so every time I enter this cafe. I deeply understand that travelers and Japanese first-time visitors get worried to see the unorganized situation, but you don’t need to hesitate. You saw this cool cafe on your travel guidebook and wished to try it after the long way to Shibuya, Tokyo. 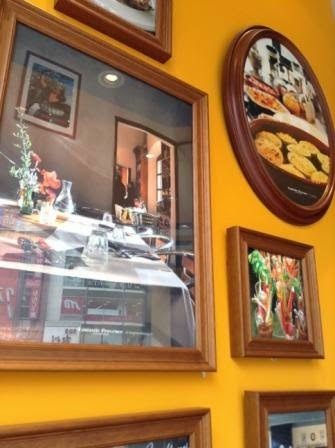 Enjoy their great foods in one of the largest gourmet cities in the world. Enjoy the beautiful decorations and the great views through the large windows. If you don’t like waiting or perplexed situations, I recommend Starbucks across from L’occitane. This particular Starbucks, where you buy in the ground floor of Tsutaya CD shop and tables are in the 2nd, is the Busiest Starbucks in Japan. There are so many, too many choices for lunch in Shibuya, but you won’t have any questions in world-wide Starbucks. And it is facing the Scramble Crossing as well. Well, some Shibuya posts will come soon. Don’t miss it!